« Do Facebook videos or YouTube videos perform better on Facebook? While social media has been embraced as a large part of an overall communication strategy, it can also be used as a powerful weapon by people in reaction to unpopular plans and policies. Institutions must now consider how to react to public opinion — from a Change.org petition, Facebook campaign or a viral video on YouTube. In addition to this, the portability and capability provided by smartphones to access social media have allowed groups of individuals to communicate and organize very quickly and effectively in support of causes. As we looked around at the advocacy landscape, it was clear that while a few high-profile causes have had a tremendous amount of visibility and success, the majority of worthy, important causes do not generate enough attention and action to reach their goals. Perhaps what’s even more important to consider is that the attention and support they do generate does not lead to any specific actions that could make a difference. This has been the main complaint that many have raised regarding what’s referred to as “slactivism” or “clicktivism” — that the actions are too insignificant or detached to have any lasting value. While Change.org, Facebook, YouTube, Twitter and blogs are viable platforms to disseminate information and raise awareness, they do little to assist in shaping a strategy and directing behavior to effect change over time. Thus, the need for a new generation of digital advocacy tools that contain built-in action and that can be used to help build and drive an ongoing campaign. 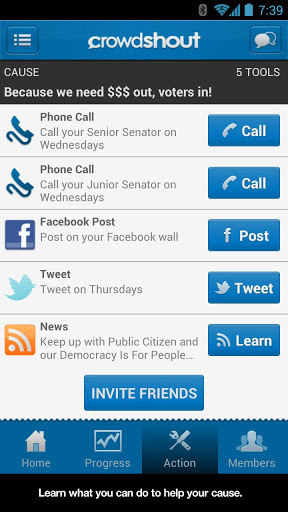 Crowdshout redefines social activism for the mobile age. We built Crowdshout as a mobile application to put social action in people’s hands so you can stay involved and connected to the causes you care about. By leveraging the power of the smartphone, we use location and calendar-based information to drive coordinated actions designed to make a difference. On the Crowdshout platform each cause is configured with a set of action tools to help promote the cause. Action tools include sending email messages, tweeting on Twitter, posting to your Facebook wall, making phone calls, and reading the latest news items about the cause. We also have plans to incorporate more than a dozen unique action tools into the platform to drive targeted group behavior in support of causes. Our goal was to make it very simple for cause participants to take a series of actions. We leverage a concept we call “micro actions,” a number of small tasks taken by individuals that get magnified through group participation. When you join a cause, the tools for that cause are configured into the notification system of your phone to remind you to perform the actions at a specified time. The tools are predefined email templates, filled out phone scripts completed, suggested Tweets and Facebook posts, and individuals are asked to take action at specific times over the course of the cause campaign. The timing aspect is important because one of the unique capabilities of the Crowdshout platform is coordinating actions by many people at the same time for maximum impact. Think about creating a “tweet storm” on Twitter, or initiating a phone campaign blitz to light up the telephone switchboards of U.S. senators or representatives. Crowdshout is offered in two ways. First, as an open platform we invite individuals to join and create causes and action plans, and invite your friends or other Crowdshout users to help you in taking actions to make a difference. If you are an organization or a group and would prefer a “branded” experience, Crowdshout is also offered as a service. The Crowdshout app can be rebranded to fit the look and feel of your organization while leveraging all of the Crowdshout tools and infrastructure to provide a specific branded experience for your supporters. You can check us out at crowdshout.com, download the Android app on Google Play or look us up during SXSW Interactive starting Friday. What do you think? Would you use Crowdshout? Glenn Vander Laan is a co-founder of Crowdshout. You can find him on Twitter at @glennvander. Contact the team at [email protected]. Glenn, one thing I was wondering: Are you working on an iPhone app? Or are you sticking only with the open source Android mobile platform? JD, thanks for asking. The Crowdshout app on iPhone is scheduled for an April release.